Feeling down from time to time is a normal part of life and the human experience. Reaction to specific events in our lives — like losing a promotion at work, a relationship breakup or even worse, a death in the family. These events can cause us to feel blue, extremely sad and maybe even helpless. The emotions experienced may not be something to be too worried about initially. 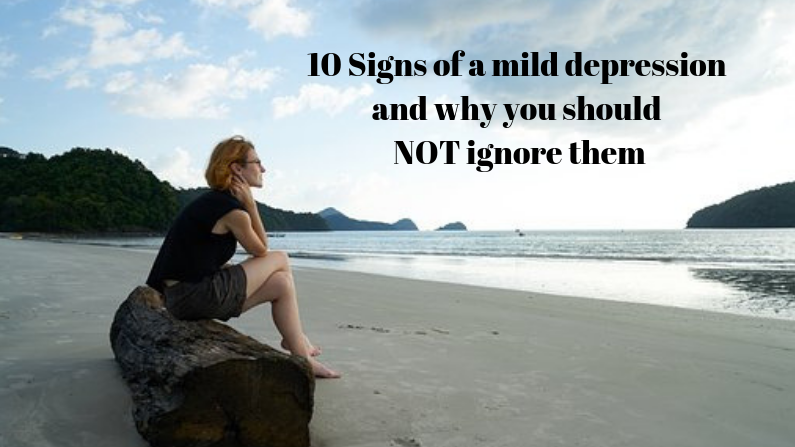 HOWEVER, if the symptoms are persistent for longer than a couple of weeks and you have been feeling miserable and down most of the time, have had anxiety or have lost pleasure (or interest) in your usual activities then you could be suffering from a mild depression. Having depression makes it difficult to function and enjoy life like you once did. Trying to get through each day can be totally overwhelming. Mild depression can hit you when doing nothing in particular or you are just living your life. Almost suddenly you can’t seem to function anymore. Everything seems to be a struggle and you feel like you’re in a black hole that just gets deeper and deeper and you can’t get out of it. lack of energy, feeling unusually tired – do you have the feeling you could sleep 14 hours a day? Often simple lifestyle changes can help treat mild depression. Enough sleep, light exercise and a healthy diet and supplements can help a lot. These are probably the most important changes to be made! Simple, not necessarily easy. It requires information, dedication, perseverance, inspiration and motivation. Alternative methods of treatment can significantly help improve symptoms. Don’t try to treat depression on your own and do not replace conventional care for these alternatives. St. John’s Wort is probably the best known herb used to treat both anxiety and depression. It works as a natural remedy for that can be compared to the efficacy of selective serotonin reuptake inhibitors (SSRIs). SSRI’s are a common type of antidepressant that’s prescribed today. Research shows that St. John’s wort has fewer side effects than standard antidepressants. Dr Axe has an in depth article on the herb here. Vitamin D acts like a hormone in the body and affects brain function. Deficiency is linked to an increased risk for mood disorders, including depression and seasonal affective disorder (SAD) or winter depression. Research has not yet shown clearly whether low vitamin D levels cause depression, or whether low vitamin D levels develop because someone is depressed. 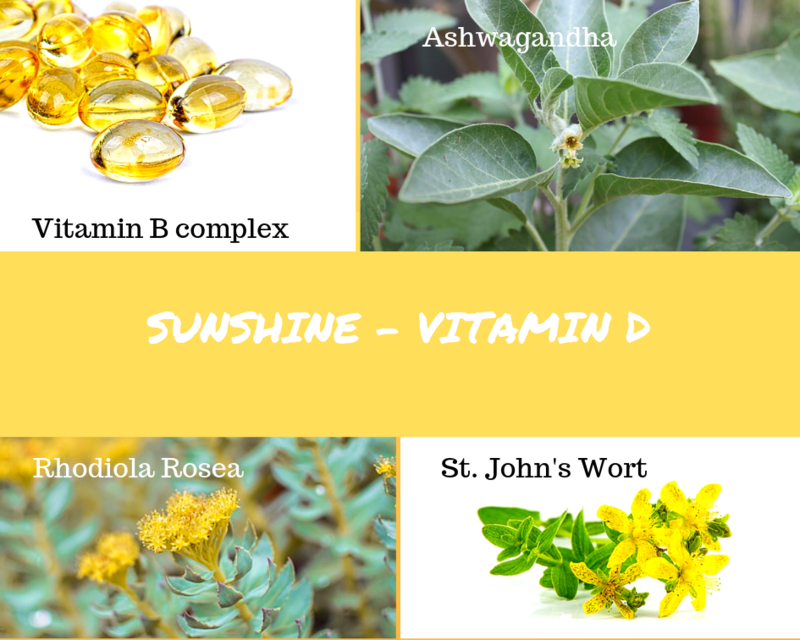 It might be a good idea to get levels checked before embarking on taking high doses of vitamin D3. It is also recommended here and here to take vitamin K2 in conjunction with D3. B vitamins are involved in neurotransmitter function and research shows that low levels of both folate and vitamin B12 levels, in particular, are linked to depressive symptoms. Vitamin B12 supports the nervous system and boosts energy levels. Folate supports nutrient absorption and helps to reduce irritability and fights fatigue. Taking a B-complex vitamin will help to produce serotonin naturally and relieve depressant symptoms. Ashwagandha is one of the most important herbs in the Indian Ayurveda. It is also an adaptogenic herb which means it is a substance that helps the body adapt to stressors. It is an excellent choice if you have depression with anxiety, insomnia and stress. Another great thing about ashwagandha is its ability to reduce cortisol levels. Rhodiola rosea (Arctic Root) is a top-rated adaptogen, a natural substance that increases your resilience to physical and emotional stress. It works by increasing the activity of brain chemicals that impact mood like serotonin, norepinephrine, and dopamine.These neurotransmitters help to increase focus and memory, and improve mood. It has been shown to reduce depression symptoms faster than antidepressant medications. It’s particularly useful for depression accompanied by anxiety and fatigue, depression caused by seasonal affective disorder (SAD), or when you need results quickly. There are many more adaptogens that can support during depression – more information here. But the best part about these natural remedies for depression is that there are no adverse side effects, as opposed to most antidepressant medications. It’s best to do some research before starting any dietary supplement. Because some herbal and dietary supplements can interfere with prescription medications or cause dangerous interactions, talk to your doctor about potential risks or possible complications with pre-existing conditions. Also remember, natural remedies are similar to prescription medications in that not everything works the same way for everyone. It can be a lot of trial and error. Although essential oils aren’t a cure for depression, they’re a drug-free option that may help relieve some symptoms and help manage the condition. Essential oils, in most cases, are safe and free of side effects. Lavender is known as one of the most versatile and popular essential oils. Its floral yet earthy scent is often valued for its calming effects. It is an excellent treatment for anxiety and does not make you tired. Lavender is a calming oil which can help to treat headaches, insomnia, aches and pains. Wild Orange helps to reduce anxiety, lowers the heart rate, improves mood, calms the mind and body and last but not least helps increase serotonin (a neurotransmitter that is often low in people suffering from depression.) It is an uplifting and stimulating essential oil. Bergamot can help to relieve anxiety, depression, stress and other mood disorders. Benefits include communicating signals to the olfactory system (sense of smell), stimulating the brain to exert neurotransmitters (e.g. serotonin and dopamine) to regulate mood. Ylang Ylang has a sweet and spicy aroma which has both calming and uplifting effects. It can also help release anger, improve self-esteem and bring positivity. Inhaling ylang ylang straight from the bottle can help in a moment when you’re feeling tired or low. 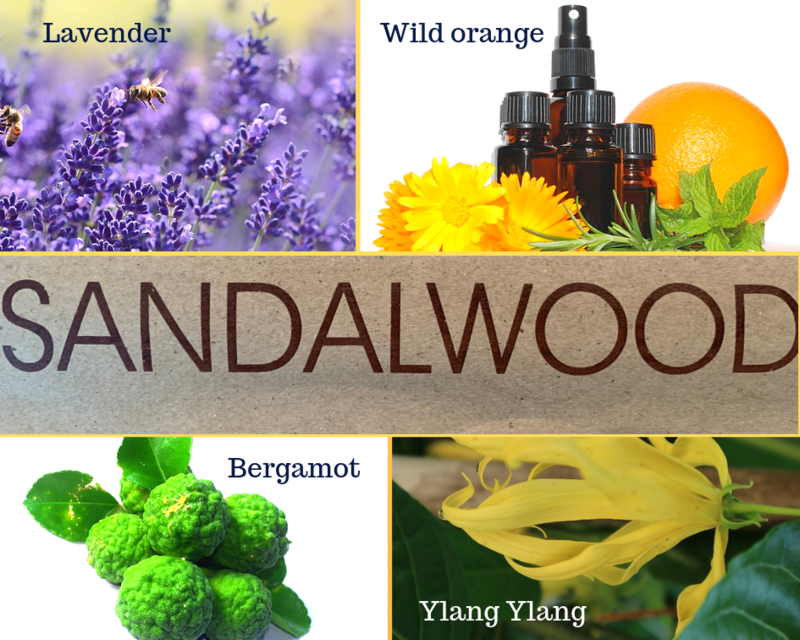 Sandalwood essential oil has a woody, warm, calming aroma. It is great to diffuse as it helps increase mental clarity and focus. Most often it is found in incense. Sandalwood scent has a powerful therapeutic effect on the brain’s limbic system (where emotional behaviour is controlled) which is why it is an excellent emotional balancer. It has soothing properties which allows it to increase sleep quality and reduce depression. Hypnotherapy is a technique that is used to reprogram the subconscious mind. In hypnosis the mind and body are in a heightened state of awareness where we are relaxed, perceptive and focused. It is a completely natural state and we usually experience it several times a day without really realizing it e.g. zoning out on our daily commute, being immersed in the book or movie we are reading or watching. In hypnosis we are susceptible to suggestions for self-improvement or behavior modification. Meditation The difference between meditation and hypnosis is that hypnosis has a goal. Meditation is great for noticing thoughts and feelings while understanding that we don’t have to act on them. Meditation is as easy as closing your eyes, breathing intentionally (or counting breathes) and repeating a single phrase or word. The thing about meditation is not to stop negative thoughts, but to pause and notice them, then return focus to your breathing. Integrative Kinesiology combines methods from Chinese acupuncture theory with Western medicine, pedagogy and psychology. It is a client-centered approach that uses a muscle test to find stressors and blockages to then compensate for these energy imbalances. It combines strengthening techniques from western and eastern healing arts to activate self-healing and to support personal development. By balancing the body in the energy system, we learn to access our physical, emotional, intellectual and energetic sources and to utilise all our potential. Compensation techniques such as adjustment exercises, colors, essences, sounds or acupressure are used to achieve and maintain the balance between the body, the soul and the mind. Acupuncture is a technique that aims to restore the balance in the body using acupoints located on each individual’s body. Traditional Chinese medicine (TCM) treats depression as a disorder that stems from imbalances of energy. In TCM, “qi” is the flow of energy through the body. Qi flows through the body on energy channels known as meridians. It is believed to stimulate the nervous systems resulting in biochemical changes influencing the bodies internal stability promoting emotional and physical wellbeing, helping remove blockages and restore energy flow. A licensed acupuncture practitioner works with very fine, sterilized needles and gently places them atop specific points on the skin to stimulate particular points within the body. Homeopathy is a system of medicine that treats the whole person, taking into account mental and bodily types as well as the symptoms of the disease. One of its main principles is that ‘like cures like’, in other words the symptoms of an illness caused by a substance will be cured by the same substance given in homoeopathic form. The medicines are not prescribed based on a person’s diagnosed disease but on the unique way a person experiences his or her disease. In other words, homeopathic medicines are prescribed based on the SYNDROME of various physical and psychological symptoms, not just a single symptom or disease label. These tips are not all encompassing. There are many many other treatments and solutions e.g. 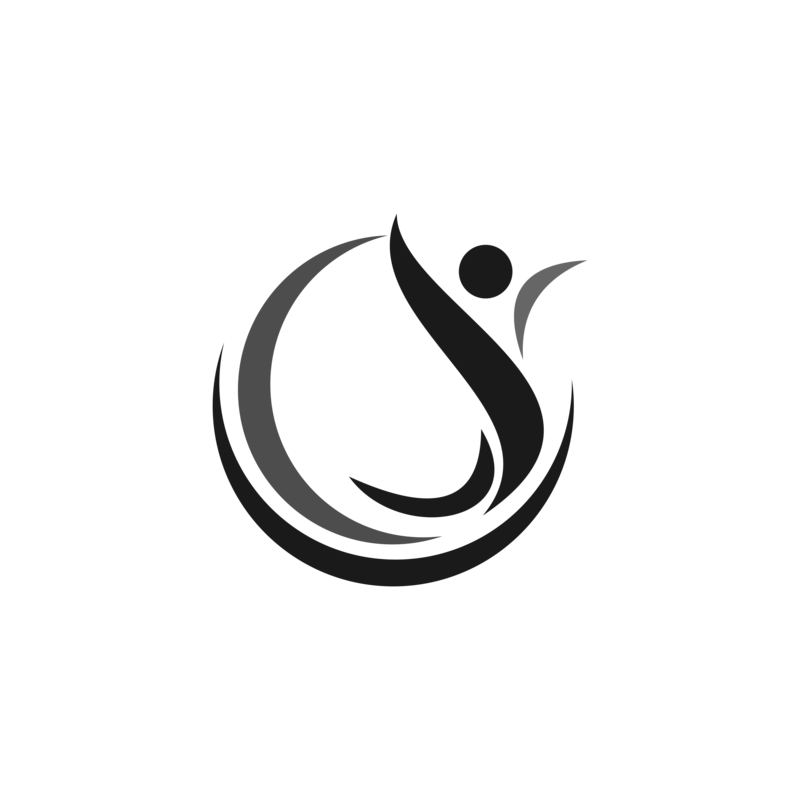 Psychotherapy, Cognitive Behavioural Therapy, Group therapies to mention just a few. While medical treatment may often not be needed, mild depression won’t necessarily go away on its own. In fact, if left alone, mild depression can progress to more severe forms e.g. moderate or severe depression. Something else to consider is, that all these natural solutions could very well be combined with conventional treatment. Disclaimer: All information provided on this website does not replace a doctor’s visit! Under no circumstances should the information be regarded as an invitation to self-diagnosis. All texts are created for informal purposes only. In case of emergency or specific suicidal thoughts, please contact your nearest psychiatric clinic or the emergency number at 112.